Not really, but only 40 miles up the M11. Liverpool but moved south to Harlow when I was 5 and brought up around Stansted. Real ale and Scotch Whisky. Climbing out of my cot. That would have been old 78rpm records from a boy scout jumble sale to play on a wind-up gramophone - also bought at a jumble sale, it was an Edison Bell Discaphone. My first new vinyl record was probably Chicken Shack's "40 Blue Fingers Freshly Packed" in 1968 - or was it Fleetwood Mac? Can't really remember - well it was the 60s and I was there! Alas lost long ago... Still got the Fleetwood Mac though. Apart from drumming I love to restore old cars and repair and make things. Black Sabbath at Ewell Technical College in about 1968. I was up front next to the PA speakers and my ears are still ringing over 40 years later! The band came on very late and there was a funny burning smell coming from the dressing room. It was incredibly loud and heavy, and probably put me off Heavy Metal ever since! Selling advertising space in an accountancy magazine - only lasted 2 days. Got a Millenium Products award from the Design Council for an invention in 2000. Don't leave us in the dark, then - what was it? To qualify for the Design Council Award it had to be British, innovative and ecologically friendly. I applied and got accepted. Occasionally played in Loose Talk - a three (and sometimes four) piece function band. Occasionally played in Buzz With The Fuzz - a blues band. Best band I was ever in was Stevie King's Bluecats. There were a few others and some the one-gig-a-year type. Did the house band drumming at Bishops Blues Club Jam in Bishops Stortford for several years and was house drummer at the start of the Hot Hob Jam in Brentwood. Rambling Jack's Blues Club at the Railway Hotel, Bishops Stortford in the late 60s. Saw Fleetwood Mac and Free amongst many others. John Mayall, Clapton and Cream were a big influence. I play a little Banjo Ukulele - George Formby stuff. 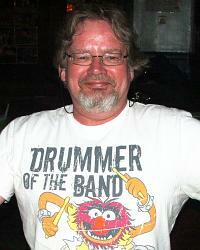 On drums, I enjoy all R&B including Soul, Classic Rock - basically almost anything with a beat. I listen to Radio 2 and all that type of stuff. Clapton, Stevie Ray, Peter Green, Lately Matt Schofield and Ian Siegal. I played drums at a Jam with Ian Seigal in Bishops Stortford. It was magical at the time. Obviously a good drum kit. I currently have a Mapex Orion large kit and would now like something smaller and lighter to drag around. DW (Drum Workshop) drums are the Rolls Royce of drum sets so a small DW kit would be great. ...and obviously, me on drums! There have been a few - far too embarrassing to talk about. When my son Tom graduated from university. Now waiting for my daughter to produce a grandchild. The cameraderie and getting a chance to play with other great musicians in a relaxed situation. I don't know enough actors to answer that one. Yes - I love it. Alone Again Or by Love, from "Forever Changes"
Higher Ground - Stevie Wonder, from "Innervisions"
Prelude / Nothin To Hide - Spirit, from "The 12 Dreams of Dr. Sardonicus"
Cinnamon Girl - Neil Young, from "Everybody Knows This Is Nowhere"
Good Day Sunshine - The Beatles, from "Revolver"
A packet of Marijuana seeds. Be humble and grateful for what you have and take each day as it comes - you never know what the future holds. I can't, because then it wouldn't be a secret any more.